This safety alert reminds all inflatable life jacket users of the importance of performing periodic maintenance on their equipment. Instances of fatal accidents where inflatable life jackets failed to properly inflate have been documented. When a life jacket fails to inflate properly, the results can be life-threatening. Unknown bladder leaks may exist, fabric degradation or an improperly installed CO2 cylinder is all it takes to render an inflatable life jacket ineffective by preventing its inflation or ability to stay inflated. b. Check for visible signs of wear or damage by ensuring that there are no rips, tears or holes; that the seams are securely sewn; and that the fabric, straps and hardware are still strong. c. For auto-inflating life jackets, ensure all auto components are armed and not expired. Following the manufacturer’s instructions, reveal the inflation system and oral inflation tube. Check that the CO2 cylinder is firmly secured. Examine it for rust or corrosion. If you remove the CO2 cylinder for inspection, be sure to carefully replace it without over-tightening. d. Repack the lifejacket as per manufacturer’s instructions. Ensure the pull-tab lanyard is accessible and unlikely to be caught when being worn. a. Inflate the bladder using the oral tube and leave it overnight in a room with a constant temperature. If the bladder loses pressure, take the lifejacket to an authorized service center for further tests. Do not attempt to repair a life jacket yourself. 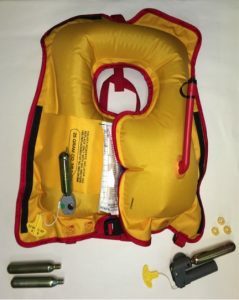 If there is no obvious loss of pressure, deflate the life jacket by turning the cap of the inflation tube upside down and pressing it into the inflation tube. Gently squeeze the inflatable life jacket until all air has been expelled. To avoid damage do not wring or twist the life jacket. b. Repack the lifejacket as per manufacturer’s instructions. Ensure the pull-tab lanyard is accessible and unlikely to be inadvertently snagged when being worn. Store your life jacket in a dry, well-ventilated location away from dampness and out of direct sunlight. It’s important to rinse your life jacket with fresh water after salt water exposure and dry it thoroughly prior to storage. If your life jacket is set for auto-inflation, remove the auto-inflation cartridge prior to rinsing. The life jacket manufacturer may have specific requirements, so read the instructions on the lifejacket. This safety alert is provided for informational purpose only and does not relieve any domestic or international safety, operational, or material requirements. 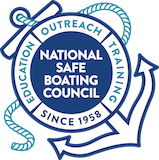 Developed by the Office of Auxiliary and Boating Safety and the Office of Investigations and Casualty Analysis. Questions or comments may be sent to HQS-PF-fldr-CG-INV@uscg.mil.